Shooter Jennings is a hit with Bad Magik! Shooter Jenning‘s new album found it’s way into my stereo so I thought I’d give it a listen and tell y’all what I think. 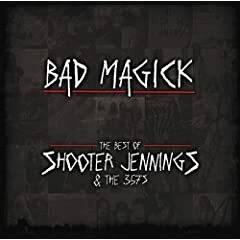 Although I’m not a fan of country music’s ‘need’ to release a greatest hits before an artist has been long gone, I found myself really loving the collection of songs put together on Shooter Jennings’ latest release “Bad Magik“. “Bad Magik” covers the entire spectrum of styles Shooter finds himself writing in, and flows really well from song to song. It’s the same raw, uncontrolled music and lyrics we’ve all come to love and enjoy from Shooter Jennings. All in all, I gotta say, it’s pretty good stuff and I highly suggest picking it up if you’re a die hard fan and even one for a friend that’s never owned or heard a Shooter Jennings album. I give it a 4 out of 5. Now, enough of this ‘been there, done that’ crap. Put out another record with NEW songs, Shooter! Find the most current Shooter Jennings tour dates from our partners at Country Music On Tour, your trusted country concert ticket source! Country Music News Blog participates in advertising programs that help fund the operation of this site. For more information please visit our privacy statement. This entry was posted in Shooter Jennings by umpump. Bookmark the permalink.